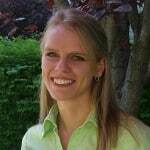 This is a guest post by Christy Fechser. Is the cleaner you’re using to spray your counters, your fridge, your stove, or even your baby's high chair safe to use? I was horrified! I can’t use it on my kitchen surfaces?? I had used that particular cleaner to clean EVERYTHING, as did my Mom when I was growing up. It dawned on me in that moment that just because they kill germs it does not make them safe (which I probably should have realized sooner). You cook on those surfaces and your kids drop food on those surfaces and then eat that food. Topical exposure isn’t the only worry though. When you spray a surface you are dispersing those chemicals into the air for everyone to inhale. They can do a lot of damage to our lungs and other organs. Often times we think that we are using household cleaners to “clean” but take no mind of what they are leaving behind. I’m not sure which is more dangerous, the germs on the counter or the chemicals that killed the germs. Of course, we want the surfaces in our home to be clean but we want them to be clean of chemicals as well. So what do we do? We can make our own cleaners that are very effective at killing germs while not causing harm to our family members. I have an easy to make and easy to use list of DIY natural cleaners that smell good and work great! One word of caution when using citrus oils… Citrus oils can eat plastic, so you may want to use a glass spray bottle for long term storage of cleaners that contain citrus oils. Add all ingredients to a spray bottle. Shake thoroughly before spraying. Pour ingredients into a spray bottle, and shake to blend, apply and wipe clean. Combine in a large bucket. Use a mop or rag to clean the floor. Rinsing optional. Mix baking soda and salt together. Add the oils to the vinegar. Spray the inside of the toilet bowl with the vinegar mixture, and then sprinkle on the powder. It should be fizzy; if it is not, spray a bit more vinegar. Let cleanser sit 10-15 min. before scrubbing with a brush. Flush. Mix all the ingredients together. You can add more water depending on how thin or thick you want the mixture to be. Paint on with foam craft brush (or your hand if you want to). Let sit for 15 – 20 min. Get it wet with a spray bottle, scrub with a scouring pad, and wipe clean with a wet cloth. You can easily use a diffuser to disperse the aroma of essential oils in your home or you can also use a spray bottle. Mix with water in a spray bottle. Mix in a container with a sprinkle top or one you can make holes in to create your own sprinkle top. A large yogurt tub works good. Sprinkle on the carpet. Let sit overnight and then vacuum. 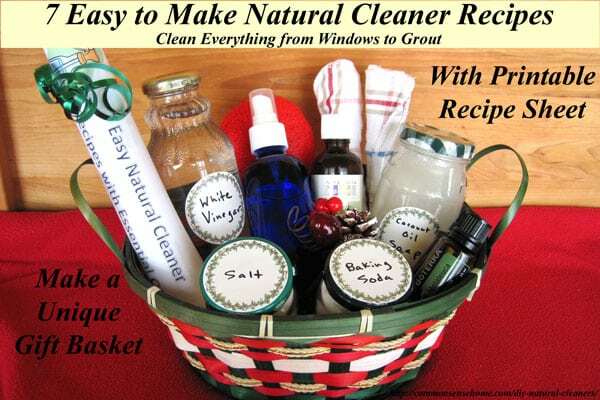 What homemade cleaners do you like to use? We'd love to hear about them! P.S. 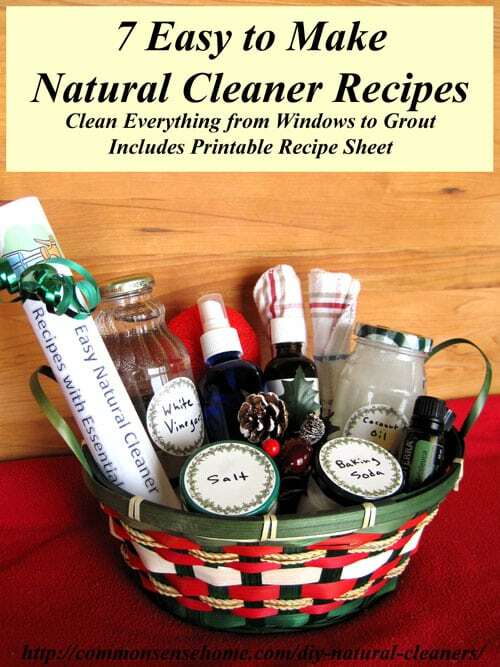 Editor's note: I've put all the recipes in an easy to print pdf file with the recipes on one page and the label text “7 Easy Natural Cleaner Recipes with Essential Oils” on the second page. 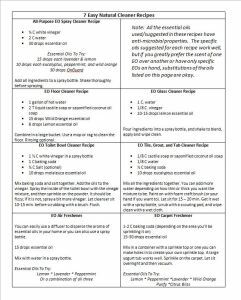 You can print just the recipes for easy reference, or print the two pages back to back, roll the recipes up and include them in a gift basket with the ingredients to make the cleaners. To make a gift basket, I gathered an assortment of glass jars to repackage bulk items in a basket from the thrift store. (I knew I was saving those bottles for a reason.) I also included a few bottles of essential oils, a glass spray bottle, an upcycled kitchen scrubbie, and two kitchen washcloths. Christy Fechser is the wife to 1, mother of 3, lover of health, wellness, the beach and sunshine. She is passionate about living an inspired life and loves to inspire others to live life at their fullest. You can find her online educating others on how to live a more natural lifestyle, especially on how to use essential oils. You can read more about Christy at Modern Wellness. You can also find her on Facebook, Pinterest, and Twitter. We use tea tree oil in our general cleaners for the added antibacterial qualities! I enjoy reading your posts and am just getting started in trying to switch over to all organic. My husband is dragging his feet though I hope to get him to come around soon. Thank you for all the hard work you do to help everyone that wants it to live a better life. I do one thing at a time. When my family gets used to that one change, I make another. They don’t realize how many changes have taken place over time! 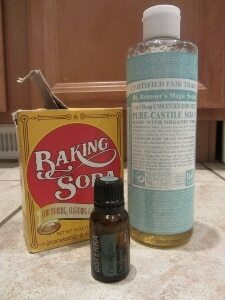 For air freshener, dissolve baking soda in water, then add your essential oils. The baking soda will help neutralize odors in the air/furniture/etc. Be sure to shake well each time you spray. If you dissolve the oils in alcohol ( rubbing alcohol or vodka) rather than water you will get a better, longer lasting smell! what ratio do you use on these ingredients? “Pour some alcohol or vodka into the spray bottle – about one to two tablespoons. Then put your essential oil or fragrance oil drops in. You can experiment with how strong you want it to smell. I usually put 25 – 35 drops. Put the lid on, and shake it up for a few seconds for the oil to dissolve. Then, fill it all the way up with water. They use rubbing alcohol for a room freshener, vodka anything that might be in contact with the skin. LOL I just had to say that the window cleaner is the same as the all purpose cleaner, it is just half the recipe. For an all-purpose cleaner, some recipes call for 1 part vinegar to 1 part water. However, your recipe calls for 1 part vinegar to 8 parts water. Why is there such a discrepancy to ratios? Also, what is the purpose for essential oil? Is it simply to make the cleaner smell nice or does it have cleaning benefits? In addition, what is the benefit to baking soda and why is it included in some recipes and not others? The recipes are different because people are different and have different preferences. A 1:1 water:vinegar ratio is pretty strong smelling, but you can certainly use more vinegar if that’s your preference. The essential oils add a pleasant scent, but they are also antimicrobial and can help break down stains and scuff marks. Baking soda acts as a gentle abrasive, which may or may not be desirable, depending on the cleaning job. I did not know that about citrus oils. I have lots of spray bottles but they are all plastic. The only glass ones I have are small – 1-2 ounces. I will have to find a source for larger ones. What I like best about blogs like yours is all the extra information that comes in the comment section. The oils won’t eat through immediately, but over time they will make the bottle more brittle and prone to breakage. If you mix up smaller batches and use them relatively quickly, you should be fine. 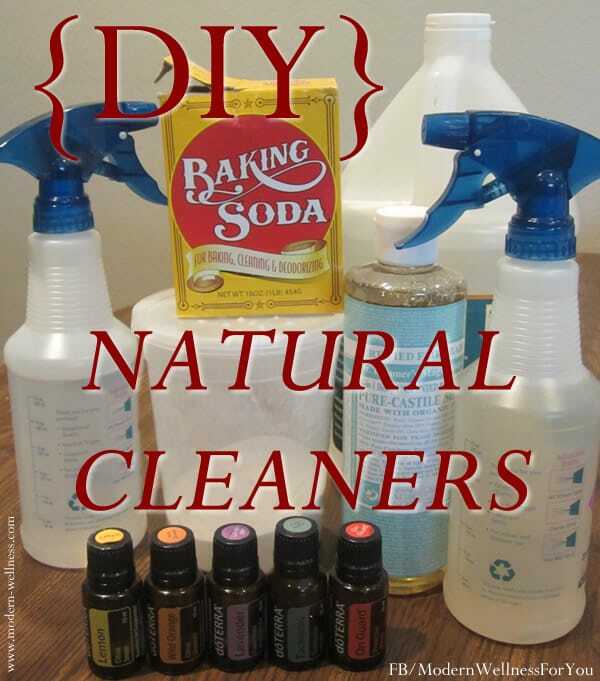 I have heard of using natural cleaners before,but never thought of making it on my own.This post gave me good home made idea.Thanks a lot for this information. I tried the Tile, Grout, and Tub Cleanser…I guess it’s meant for grout in the tub area, as it’s easier to rinse. I used it on my bathroom floor and it took me forever to get rid of the ‘suds’. I like this but would use half the soap at most next time! Thanks for taking time to share your experience. I suspect that was indeed Christy’s intention.